"Peter Pan is a great and refining and uplifting benefaction to this sordid and money-mad age. "—Mark TwainOne hundred years after J. M. Barrie published the novel Peter and Wendy, Maria Tatar revisits a story that, like Alice in Wonderland, bridges the generations, animating both adults and children with its kinetic energy. The adventures of the Darling children with Peter Pan and Tinkerbell in Neverland are the seminal tale of escape and fantasy. Inspired by Barrie's real-life adventures with the five Llewelyn Davies boys he adopted, the story of Peter Pan has a deep and controversial history of its own that comes alive in Tatar's new edition. This brilliantly designed volume—with period photographs, full-color images by iconic illustrators, commentary on stage and screen versions, and an array of supplementary material, including Barrie's screenplay for a silent film—will draw readers into worlds of incandescent beauty, flooding them with the radiance of childhood wonder and the poignancy of what we lose when we grow up. 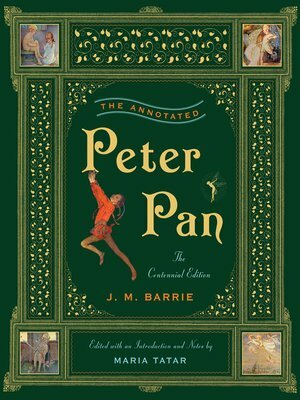 J. M. Barrie (1860-1937) was a Scottish author and dramatist, best remembered today as the creator of Peter Pan.